World Book Night is an annual celebration of reading that takes place on 23 April. It sees passionate volunteers give out hundreds of thousands of books in their communities to share their love of reading with people who don’t read regularly or own books. World Book Night is run by The Reading Agency, a national charity that inspires people to become confident and enthusiastic readers to help give them an equal chance in life. 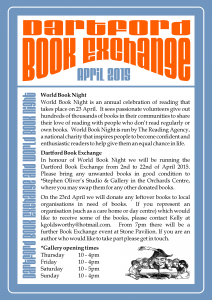 In honour of World Book Night we will be running the Dartford Book Exchange from 2nd to 22nd of April 2015 extended indefinitely. Please bring any unwanted books in good condition to *Stephen Oliver’s Studio & Gallery in the Orchards Centre, where you may swap them for any other donated books. 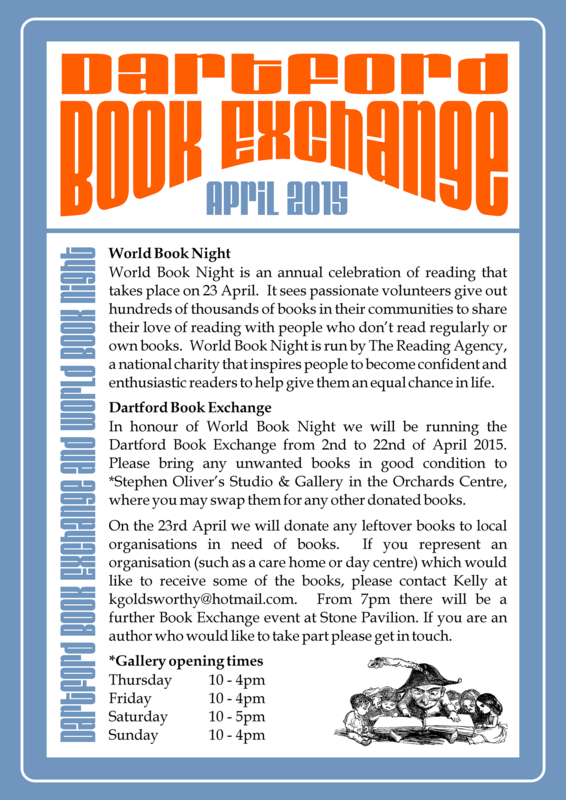 On the 23rd April we will be making a donation to local organisations in need of books. If you represent an organisation (such as a care home or day centre) which would like to receive some of the books, please contact Kelly at Grehan. From 7pm there will be a further Book Exchange event at Stone Pavilion. If you are an author who would like to take part please get in touch.